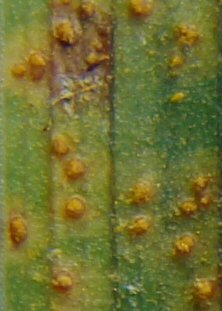 Daylily rust is caused by the fungus Puccinia hemerocallidis. It is not a new disease of daylilies, having been reported previously from China, Taiwan, Korea, Japan and Russia (Sakhalin, Kuriles and Siberia). There is a record of daylily rust specimens having been collected in Siberia, Russia, as long ago as 1878. Unfortunately, the disease is now also in North America, having first been identified in the south-eastern United States in August 2000. While it was initially spread to many other areas on shipped plants, the main method of rust spread in nature is by wind blown spores. Daylily rust so far appears to have successfully overwintered in the warmer areas of the United States to USDA Zone 7. 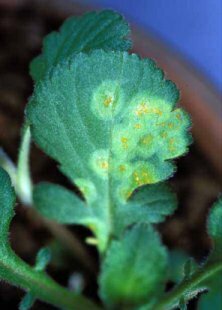 It apparently does not persist in all infected Zone 7 gardens however, therefore it is hoped that rust will not be a significant problem in colder zones unless, perhaps, it can utilize the alternate host, Patrinia, as it does in Asia. Thus far there are no reports of its having done so. It is conceivable that daylily rust could persist in some colder areas than one would otherwise expect where there is a protective covering of deep and continuous snow throughout the winter, or perhaps under a heavy winter mulch, or in close proximity to a warm house wall. Of course, it may also persist in greenhouses. In the current absence of researched information specific to daylily rust it would be prudent to assume that the fungus could potentially overwinter anywhere that at least some infected daylily foliage remains green through winter even if Patrinia is not present. � Susan Bergeron 2002-2014. Last updated 2nd February 2014.